Happy May Day!!! It is officially the first day of May and that means it is mental heath awareness month. 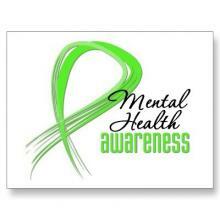 Unfortunately, many people are unaware that May is mental health awareness month. It saddens me that the media (as whole) does not make it a major deal like they (the media) do in October when it is Breast Cancer Awareness Month. Don’t get me wrong we need education on Breast Cancer as well as other cancers however mental health deserves just as much attention as other health issues, such as cancer. People like myself fight the stigma of mental illness on the daily basis. Discrimination is a major issue for those of who struggle with a mental illness and it is also something our loved ones have to deal with as well. No one and I mean no one deserves to be discriminated against because of an illness they struggle with or loved one struggles with. I hope that I will be able to continue to educate people on mental illness for the rest of May and beyond. I hope to share more of my personal story to give hope to those who a struggling with mental illness and show them that recovery is possible. Recovery is not easy but it is possible. I also hope to discuss current laws in regards to mental health and pending bills that are being discussed in the House as well as the senate. One of which is Murphy’s Bill. All of what I hope to discuss is dependent on how busy life gets. Life being busy is partly why I haven’t been able to blog the last month and half. I love blogging and sharing my recovery with others as well as educating others. I hope to blog again at some point this weekend with more educational material if not more of my personal recovery story. Please do not forget to educate people on mental illness and make people aware that May is mental health awareness month. Peace Out!! Gertie, great guest post. Lots of good information.